In Riviera Nayarit, culture is our luxury. This is the reason why we’re celebrating the eighth edition of the Festival Artistico Cultural Rincón de Guayabitos, which will bring joy and fun to suit every taste, taking place every Saturday between February 2 and 23. Music and dance will be presented every Saturday in February on the main square, starting at 20:00. Featured participants will include the Déjá vu, Nayar Dance Company, Havy Rodriguez, Youth Mariachi of Tepic, Youth Chorus of La Peñita de Jaltemba, Nayare Dance Company and Women’s Mariachi of Arenal. Admission is free. 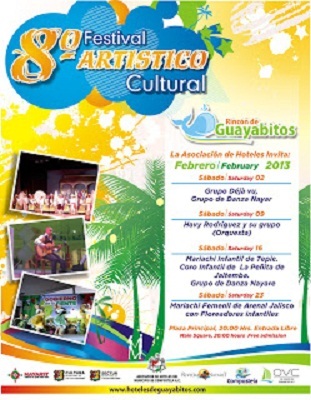 The Convention and Visitors Bureau (CVB) of Rincón de Guayabitos and the Association of Hotels and Motels of Compostela organize this Festival each year, with support from the Government of the State of Nayarit.